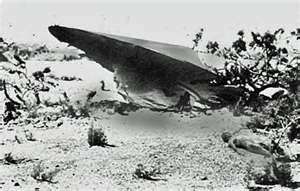 In July 1947 there were reports of an object that crashed in the general vicinity of Roswell, New Mexico, with some alleging that an extra-terrestrial spacecraft and its alien occupants had crashed there and were recovered by military personnel. The U.S. military maintains that what was recovered was debris from an experimental high-altitude surveillance balloon belonging to a classified program named “Mogul.” However, to this day many conspiracy theorists and others claim that it was all part of an extravagant cover up by the United States government, and that a UFO actually crashed on that day. A rancher named Mac Brazel and others reportedly hear a loud crash during the night near Corona, New Mexico. Mac Brazel finds peculiar crash debris on the Foster Ranch. In the town of Corona Mac Brazel hears about a $3,000 reward for the debris of a crashed flying saucer. Mac Brazel showed pieces of the wreckage to Chaves County Sheriff George Wilcox. Wilcox called Roswell Army Air Field (AAF) and talked to Major Jesse Marcel, the intelligence officer. Major Marcel drove to the sheriff’s office and inspected the wreckage, at which point William Blanchard, Marcel’s commanding officer, ordered there recovery of the wreckage. Military police arrived at the sheriff’s office and collected the wreckage to bring to Blanchard’s office. The wreckage was then reportedly flown to Eighth Air Force HQ in Fort Worth, and from there to Washington. Marcel filled his vehicle with more wreckage. and at around 1-2 a.m. he showed his wife and son the strange material he had found. His son, Jesse Jr., later recalled that there were pink,purple, lavender symbols along the centre sections of some of the small metallic “I” beams in the debris. 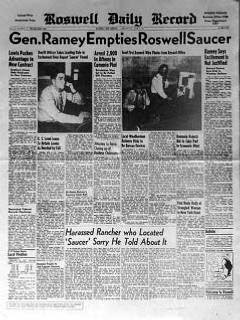 Information about a UFO crashing is put on the AP wire.The only newspapers that carried the initial flying saucer version of the story were evening papers from the Midwest to the West, including the Chicago Daily News, the Los Angeles Herald Express, the San Francisco Examiner, and the Roswell Daily Record. The New York Times, the Washington Post, and the Chicago Tribune were morning papers and only carried the alleged “cover-up story” the next morning. In the following investigations it seemed that only one couple, Mr. and Mrs. Dan Wilmot, saw what they believed was a UFO “flying disc” the night of the alleged crash. According to various reports they described sitting on their porch at 105 South Penn. at about ten o’clock when a large glowing object zoomed out of the sky from the southeast, going in a northwesterly direction at a high speed. It was only visible for about 45 seconds, the couple estimated, and was going at about 400 to 500 miles per hour. Generally thought of as a reliable person, Wilmot reported the details of what he and his wife had seen just minutes before announcements that the RAAF was in possession of a crashed object. Conspiracy theorists claim that it was on the afternoon of July 8 that military personnel substituted the wreckage of a balloon for the real crashed debris. Officials soon emerge saying that original officers at the scene from Roswell were fooled and the material was simply that of a weather balloon. It is alleged that officers located Brazel and questioned him. He was then taken by the military to the office of the Roswell Daily Record, where he issued a much revised version of his story. It was reported that officers from the base then visited newspaper and radio offices in town and recover all copies of the original press release. Brazel was also then taken to radio station KGFL, where he again gave his revised version of the incident. The Roswell Daily Record runs a second story with the new official information. Jesse Marcel comes out to claim that the weather balloon announcement had been a cover-up, and that the original UFO story was the real facts of the case. Jesse Marcel Jr. writes a book detailing the real events around the Roswell incident as told to him by his father.